President Trump spoke today to employees at the Lima Army Tank Plant in Lima, Ohio. After eight long years of Barack Obama, President Trump is breathing life back into the manufacturing facility, the last tank manufacturer in the Western hemisphere. 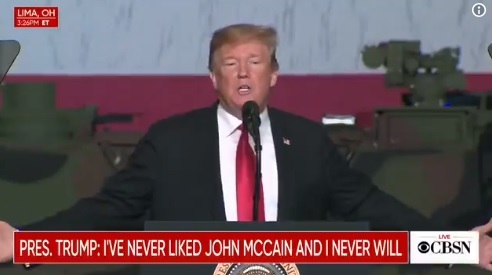 President Trump dragged John McCain again. The late senator ruined the GOP’s chance to repeal and replace Obamacare. Senator McCain was also behind distribution of the bogus Trump-Russia dossier. At one point in his speech President Trump mentioned that “Crooked Hillary” paid for the fake Trump-Russia dossier.